at the recent Singapore Music Awards. Other nominees in the category included artists such as Dido and Craig Davis. Swedish Pop Sensation Earns Golden Globe Nod. 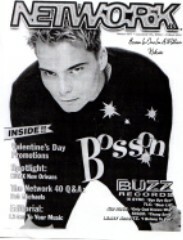 New York, NY, January 8 - Swedish singer Bosson sold over 100,000 singles in the U.S. last year and toured with pop goddess Britney Spears, but even then you may not know him from Adam. That all changes this week as his song "One In A Million" - from the smash movie and TVT soundtrack Miss Congeniality - was nominated for a Golden Globe for Best Original Song. Coupled with enthusiastic early reaction from pop radio, all indications suggest Bosson is just inches from domestic super stardom. "It is an honor to be nominated in the same category as Bob Dylan, Bjork and Sting," said Bosson. "It is really cool -- you never think that this could be possible!" When asked about his thoughts on the film, Bosson said "The movie is great and really funny. Sandra Bullock is so nice and so very talented. "One in a Million" has a very special place in the film." Described as "a slice of sheer pop perfection" by Billboard Magazine, "One In A Million" is a thumping, sensitive love song which expands on the formula that such recent hits as "Bailamos" from Enrique Iglesias and "Its Gonna Be Me" from N'Sync successfully employed. More impressively, in a pop era where artists rarely perform material they've written personally, Bosson himself penned the song. "One In A Million" is already receiving play on such influential pop stations as L.A.'s KIIS-FM and KLZR in Kansas City ahead of an official January 15 add-date. Bosson's debut album is expected to be released on Capitol Records this summer. The Golden Globe Awards will take place on Sunday, January 21. In addition to Bosson, Miss Congeniality - Original Motion Picture Soundtrack also contains hits from Groove Armada, Southern Culture on the Skids, Tom Jones (remixed by BT), and Baha Men. The film itself has grossed over $40,000,000 in just three weeks of release.